Go congratulate Steve Skojec on the birth of his daughter! The happy news, with a pic of the beautiful little girl, is here. Congrats to the growing Family Skojec! My advice is to start drinking [coffee] heavily. (1) Subdivision association gets well-deserved bloody nose. A human toothache protested the Christmas display on his/her/its neighbors' lawn. Frosty and Santa were OK, but lose the Holy Family. Subdivision association sends letter ordering removal of Holy Family (Rudolph's kosher, though) and threatens fines for noncompliance. Family contacts Detroit News. Detroit News runs cover story entitled "It's Away With The Manger." Furor erupts. Subdivision association sends regrets, fruit basket and full authorization of creche. Human toothache fumes over bowl of Grape Nuts and latest issue of Vanity Fair, and everyone else lives happily ever after. Editor develops glimmer of respect for the white-glove libertarian dishrag that is the News. (2) That Document meets with mixed reception in Detroit. Seminary officials welcome it, Jesuit priest "comes out" in protest. Surprise vanishes upon discovering fact that Fr. O'Brien turns out to be an established Dignity supporter. Editor quaffs Pepto-Vicodin cocktail upon noting terms "transgender" and "transsexual" each appear twice in the priest's presser while scripture is not referenced at all. (3) State mulls stupid plan to permit potentially toxic form of mining in the Upper Peninsula. Editor recalls that mining booms have not been good to the UP, long term. Blinky has yet to comment. (4) Local suburb misplaces time capsule. Editor recommends intercession of St. Anthony. "Being a Lions fan is great--except for that down time between Drafts." The Time: December 29, 1957. The Event: The NFL Championship game. The Score: Detroit Lions 59, Cleveland Browns 14. When the victorious NFL Champion Lions walked off the icy turf that day, Lions fandom could not have imagined that, nearly forty-eight years later, the Lions would have 1 (one) more playoff victory to their credit. Flash forward to December 24, 2000: the 9-6 Lions need a victory over the lowly Bears at home to secure a playoff spot. Final score, on a stunning last second field goal: Bears 23, Lions 20. It's an especially poignant memory for me because it was the last game my Lions-devoted grandfather ever saw. The Lions clean house, appointing TV commentator and four-time Super Bowl champion Matt Millen to head the organization. The record since? 20-55. That's .267, which is not what the Tigers are looking for in a hitter, let alone a winning percentage. Younger Lions fans (those who frequent the independent, more popular and, frankly, better of the two Detroit sports radio stations, WDFN) have developed their own lingo in the past several years, the most popular term being "cornbread." The term derives from the fare served by southern plantation masters in the slavery era. A delusional fan who, say, predicts the Lions will be in the Super Bowl, calls a draft pick unassailably brilliant, or even one who simply guarantees that Detroit will beat an equally inept team, is accused of or admits to having eaten the piping hot cornbread served by the Masters Ford. In fact, being a Lions fan at all for the past decade is an exercise cornbread eating--can't bear to leave the plantation because the food is so good. My name is Dale Price, and I am a cornbread addict. In my time of watching the Lions, I have seen them lose every possible way a team can lose. Why the perpetual ineptitude? Two words: Russ Thomas (rest in peace). Thomas was the GM of the organization from the time the Fords purchased it in 1963 to the time he retired in December 1989. Ferociously stingy, he alienated the talent the Lions managed to draft, giving the team a bad reputation it has only begun to shake over the past 15 years. Trust me--the organization has positively thrown money around since that time: the team's problems do not stem from penny-pinching. More tellingly, Thomas was a true and loyal friend to senior owner William Clay Ford, and Ford reciprocated. In fact, Ford is an admirable and likeable man by every account, and the same goes for Bill Ford, Jr. Whatever else you can say about them, they are loyal to their people and handsomely reward loyalty in turn. Throwing people under the bus is not what they do. While admirable in and of itself, that has proved to be a problem in the bottom line NFL. It may be the organization's greatest flaw: the refusal to jettison people when they don't perform. Which brings me to the now-unemployed Steve Mariucci: that he was fired during the season is a bit of a shocker. Perhaps--perhaps--it is a sign that ownership's patience is, after forty two years, running out. Time will tell. Make no mistake--Mooch's firing is really unobjectionable: the hand on the tiller was too gentle, as even Mooch guy Jeff Garcia admitted during an interview. He's a nice, just folks, UP guy who was accustomed to dealing with veterans who were self-starters at SF. That's not the situation he had here, where he had to mold and develop young talent. He manifestly did not do that here, especially on the offensive side of the ball. More damagingly, he let a divided locker room develop and fester, as can be seen by Dre Bly's appalling shots at Joey Harrington yesterday on the NFL Network. Harrington deserves criticism, and even from teammates, but not on national television. Don't worry too much about Mariucci, though: I have a strong suspicion he may be coaching up the I-96 at MSU next season. It's simply a hunch, but do not be surprised at all. He's an ideal fit for the Spartans, and he has the ultimate reference in his best friend, basketball demigod Tom Izzo. Which brings me to the final question many are asking: why not Millen, too? Isn't this the sixth year of the Five Year Plan? Well, yes, but he's secure, at least until the end of the 2006 season. There are two reasons: (1) the dogged loyalty of the Fords, and (2) he's been the best personnel guy the Lions have had since the Fords bought the team. That might not be saying much, but it's true. The Lions have gotten younger and faster, and much better on the defensive side of the ball. I could rant and rail about his multiple stupid decisions, but it's a little like complaining about the moon ruining my night sky: there's not much I can do about it. But he'd better find the right coach this time, or he will be done. the Wayne Fontes Era is our Golden Age. Fr. Jim Tucker offers a fascinating rumination on a story reporting that ABC is developing a couple of futuristic shows set after the fall of America. He wonders--gloom being the mood of the times--about other blog inquests into the future death of the Republic. After all, every great civilization eventually dies. Certainly the city-states of the Greeks, Alexander's empire, the Egypt of the Pharaohs, Zoroastrian Persia, and, everyone's favorite comparator, the Rome of the Augusti, have all passed into history. But what is striking is the persistence of some civilizations, namely China, India and Japan, and even the pedigree of some European nations: England, France and Russia, to name three. Granted, none of the above exists in the same form or currently speaks similar languages to the time of their respective foundings, but the national idea has existed in the collective consciousness of each for more than a millenium, often in the face of pestilence, invasion, crushing defeat, colonization, or near-slavery. So it is overstating the case somewhat to assert that America will vanish from the face of the Earth a la Imperial Rome or Athens. Yes, I can see a similar scenario along the lines of Fr. Tucker. Absent the arrest and reversal of the continuing declines of civic republican (note the small "r") virtue, a common culture and a basic natural law ethics, it is pretty easy to see the rise of governmental power to the authoritarian level posited by the good Father. I like to remind people that, in a republic, you can have a critical mass of individuals who practice certain essential virtues (amongst which are , say, self-restraint, willingness to delay gratification, and commitment to an open public square for the presentation of grievances and the advancement of ideas) or you can have government attempt to make up for the lack of virtue with the old iron fist standby--coercion. There is no option "c."
So, can I see some future Gibbon setting forth the decline and fall of North America (sorry, Canucks and Mexicans--you get to go down with us)? Sure. Huxley's Brave New World seems to get a little closer every day. But. While I am a naturally gloomy individual inclined to agree with a sic transit viewpoint, I also must point out a common flaw of such hypothesizing: namely, the error of the "straight-line projection." It presumes that all the negative trends will either continue or accelerate, and any self-correcting or countervailing trends will necessarily fail. It doesn't work that way, and I'll use an example from Fr. Tucker's list: gun control. A few years ago, the pro-control forces (I own three long guns, so guess where I stand?) were on the march, everywhere verging on triumph. The passage of the Brady Bill and gun-free zones laws were acheived and even registration was on the menu. The Columbine massacre was the cultural marker showing the self-evident stupidity of "unregulated" gun ownership. Today? The "assault weapons [read: mean-looking guns]" ban expired last year without Sen. Kerry being able to pluck a straw of political hay out of it on the campaign trail. Laws liberalizing the carrying of concealed weapons continue to spread. Over initial Bush administration objections, Congress authorized the arming of pilots. There is even recent federal court precedent (finally) recognizing that a citizen has a constitutional right to keep and bear arms. You are free to find fault with any or all of these things (remember that open public square idea), but a fair minded observer would have to concede that the trends of the late 1990s would not have predicted it. So, that's why I wouldn't bet against some form of America being extant a few centuries hence--and possibly even a recognizably republican one, at that. It's hard to account for all of the variables when people are involved. Anyway, Heather has taken the plunge and is a catechist for eighth graders (in a fit of obvious negligence, the DRE has not equipped her with a Taser). Since we have arrived at Advent, she has a question in need of your answer: Why is Advent only four weeks long? We get the lengths of Christmas, Lent and Easter, but what's with Advent? Clear-eyed gratitude for America and being American. SAM nails it. I endorse every jot and tittle. If I don't get a chance to say it later, Happy Thanksgiving to you and yours, and safe journeys in both directions if you have to travel. We're ignorant, but at least we feel good about it. Rich Leonardi treats us to a pair of surveys of Catholics in Cincinnati and nationwide. Here's a direct link to the data in the survey commissioned by the Reporter. Tables 1 and 13 are most instructive (no whining about PDF formats--the reader software is free, for pete's sake). Note that in the first, nearly a quarter think that a "good Catholic" could believe that Jesus of Nazareth is worm food, and in the second, half are incapable of explaining their faith. It reminds me of a friendly conversation I had with an agnostic student of Quaker background (he is studying the Greek classical era, which I admire) about the biblical canon and church councils, among other things. He said he admired the Catholic openness to scholarship and research, but was frustrated beyond words with the blinkered ignorance and utter incuriousity of most Christians regarding Christian teachings and history. All I could do was sheepishly agree and point out that in some areas, there are fledgling signs of a reversal of this trend. Houston, we have a problem. Or so you'd think. What precisely is the Catholic educational establishment in this nation doing to remedy this problem? Let's take a gander at the speaker and topic list for that establishment's crown jewel, shall we? Sponsored by the Archdiocese of Los Angeles, it is the biggest gathering of Catholic religious educators in the world, bar none. So, what's on the menu? Is it all crap? Well, of course not. There are several intriguing presentations. However, the sad thing is the above was less cherry-picking than dodging the rain of apples from the branches. Here's the rub: there are precious few hints on the list that there is a profound and well-documented crisis at the heart of Catholic life--namely, that Catholics are deeply ignorant of the fundamentals of their faith, and are incapable of communicating it to the wider world. And it is...unclear...how three days of flitting and activist tub-thumping begins to address that crisis. Which is why I think Whistling Past The Graveyard '06 is a better title. It certainly captures the tone better. While the leadership dances, another generation gets burned. You're on your own, but the good news is it's a lot easier to DIY than it was a few years back. Yoopers grow their fungi really, really big. Several years ago [the science journal article was published in 1992--ed.] a “humungus fungus” (a GIGANTIC mushroom) was discovered in the Crystal Falls area. It weighs roughly 11 tons and covers 37 acres. This makes it the largest mushroom (fungus) in the world — it’s hard to believe this monster mushroom is growing in Michigan and not Texas! Based on the average rate of growth through the soil, the Humungus Fungus is probably more than 1,500 years old. If I'm not mistaken, the Crystal Falls fungus inspired an episode of The X-Files. Speaking of Crystal Falls, it is one of my favorite places in the entire state. The autumn vista from the high point of town (it's built into a hill dominating the surrounding area) is nothing short of awe-inspiring. Zach has a few questions for the ECUSA's best known bishop, who appears to have been caught doing a Nathan Thurm impression. The power of an offhand comment. Many thanks to the off-kilter genius of Steve at Speculative Catholic! Dom tags me with a meme spreading like an Upper Peninsula fungus. I confess to owning a copy of Richard McBrien's Catholicism (one volume edition). I bought it back when I first entered RCIA, so put away the iron maiden--it's venial, at most. I confess to being a biblioaddict. For the moment, the urge to buy more is sated. For the moment. I confess to finding Andrew Greeley to be intentionally funny. I confess to always playing Age of Empires on the "Death Match" setting. I am not patient--I want my Elite Janissary or Cataphract War Machine NOW. I confess to exposing my children to the concept of sarcasm at far too young an age. Rest assured, I will pay for it later. I confess to at one point refusing to buy Catholic books published before 1965. I now live in the Bearded Spock universe where I flyspeck most everything published after 1965. I confess to watching the Detroit Lions every single freaking Sunday during the NFL season despite the fact they are a horribly-run, horribly-coached, inept organization that has not won a damn thing since my father was in short pants and shows no signs of developing a brainwave pattern that would allow them to purchase a frigging clue as to how supremely godawful they have been for going on three generations. I confess to having a very, very ribald sense of humor (think The Big Lebowski, and you are in the ballpark). If you think my stuff is flamethrowing now, you should see the stuff that I don't post. I confess to not being fully persuaded by some of the Church's teaching. On a related note, I confess to not being a "thinking Catholic," so I promise not to generate dirigibles full of greenhouse gases talking about how my brain trumps the generations of faithful which came before me. Because it doesn't. I confess to being out of ideas on this one. I confess to not getting the devotion to the Infant Jesus of Prague. One of those "leaves me blinking" deals. I confess to being a "wee bit" overweight. As in the Hiroshima bomb being a "wee bit of a noisemaker." Actually, I am tired of modeling morbid obesity for my wife and children, and am in the process of addressing it. I confess to finding certain Catholic bloggers to be irritating as fiberglass catheters. No, no names. I'm sure there are plenty of people out there who feel the same about me, so there you go. I confess to spending too much time worrying about this damn blog. Is the public library dying? In one of the many unutterably stupid and petty knife fights between our mayor and city council, funding for the library system was cut (they're mostly Dems, so the evil Republican meme doesn't apply). Of course, the branch nearest our home was the one closed by the cuts. Fitting, inasmuch as we live in the part of town gifted with the quaint Indian-derived nickname of Pisonum. So, the branch library (one of four in the entire city) sat closed for three years, while mumbled ambiguities were routinely invoked about reopening. As with all such mumblings, the inevitable happened--the city put it up for sale. But, beforehand, there was a big sale, the opening of which permitted Heather to enjoy a solid week of dread. Why? Hardcovers were $1, paperbacks .50, and the final day was "fill a grocery bag for $2." Other stuff I have forgotten but which leaves Heather with that "Carrie's mom smile" on her face. What's my point--besides bragging, that is? It is this: I didn't have to go to war to get the books (someone wanted to snaffle the Americanas, but I had half of them boxed up at that point). Sure, there were people ranging the aisles all three days, but the buyers were, with a few notable exceptions, my age or older. There are young people going to the public libraries, but more often than not they are plugged into the internet outlets--they aren't browsing the dead-tree material. That's a bad sign for the future, I think. Not growing a customer base generally is. Given the bean counter mentality in government, a lack of warm bodies is all the incentive you need to cut them first. Here where we live, "And then there were three" can dwindle to nothing in a generation. I hope I'm wrong. Just in case, though: If you want guarantee access to a library in the future, you might want to build your own. "When Winston's right, he's right. When he's wrong, well, my God." --The inimitable F.E. Smith, magnificent barrister and future Lord Birkenhead, on his close friend, Winston Churchill. That's rather how I feel about Diogenes, whom I regard as the bourbon of Catholic blogdom: ideal for the periodic neat belt while socializing on the weekend, but not recommended to float one's morning serving of shredded wheat. 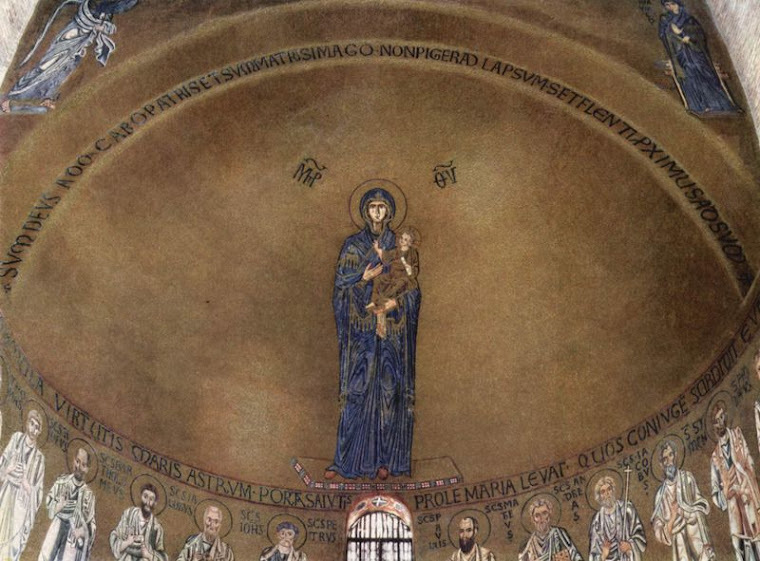 Remember the push for women's ordination -- first priestly, then episcopal -- within ECUSA? In the years preceding the capitulations the cant phrase was "Can we talk?" Dialogue was essential. Waverers were assured that the questions were not going away and to decline the debate was simply to put off the day of reckoning. Well, the innovators got what they wanted. Do you hear any of them today asking the Church to re-visit the question, to continue the dialogue about whether the restriction of the priesthood to men is not, after all, the will of God? Of course not. The change has been effected, the pawl has clicked in, there's no going back, and therefore -- as Bishop Gene would insist -- nothing to talk about. Bingo! It's what Zach Frey calls the "You talk, we'll act" phenomenon. The "dialogue" inevitably ends with: "We've won, so shut the hell up. Now." The Catholic dimension of the problem is set forth later on, so make sure to read the whole thing. The first Michigan-Ohio State clash involved guns. Though far less bloodletting than the annual tilt between the Wolverines and Buckeyes, it must be noted. A border dispute between the Territory of Michigan and the Future 250 Mile Wide Microwave/Radar Barrage led to the mobilization of militias on both sides seeking a fight. The controversy heated up again when Michigan sought admission to the union on December 11, 1833. In spite of Michigan's presence in the Toledo Strip, Ohio Congressmen successfully lobbied to block Michigan's acceptance as a state until it agreed to Ohio's version of the boundary. Massachusetts Representative and former President, John Quincy Adams, supported Michigan saying, "Never in the course of my life have I known a controversy of which all the right so clearly on one side and all the power so overwhelmingly on the other." Michigan's militia did end up arresting some Ohio officials, capturing nine surveyors, and firing a few shots over the heads of others as they ran out of the area. But only Ohio inflicted any casaulties, when a buckeye named Two Stickney stabbed a Michigan Sheriff during a tavern brawl. The sheriff recovered quite nicely. Instead, it gained title to the western three-quarters of the Upper Peninsula as compensation; 9,000 square miles of the most valuable timber, iron, and copper country in America. Not to mention stunningly beautiful country, to boot. And Toledo is still basically Michigan territory in its sympathies--as always, the most reliable indicators are the local sports broadcasts, which lead with coverage of the Wolverines, Wings, Pistons, Tigers and Lions, and not their Ohio counterparts. Speaking of which: Go Blue! Rachel is recovering from croup, I went deer hunting (damn the whitetails and their stealth technology) and work keeps mysteriously appearing on my desk (who knew?). The good news is, I am a Tom-Certified Grade-A read. Though the "over the top" thing is a bit of a head-scratcher. And Tom's Venture has seen better days, from recent accounts. Thirty years ago tonight, the Queen of the Great Lakes began her journey into a hurricane. So goes the immortal song by Gordon Lightfoot. The last words ever heard from the Edmund Fitzgerald came from her captain, who said "We are holding our own" in response to a query from the Arthur Anderson, another ore carrier that was tailing the Fitzgerald in the late evening of November 10th. The mixed bag that is the Detroit News has offered some fine coverage of the sinking of the ship, including an interview with one of the two Captains whose ships courageously went out into the teeth of the storm to look for their missing brothers. The crews of the William Clay Ford and the Anderson deserve more renown for their heroic actions of that night, volunteering to head back into the ferocious storm (several other ships, including two stronger ocean-going vessels, refused). The Captain of the Ford asked for a vote by his crew, who agreed to leave safe harbor. Speaking of brave sailors: if you are ever in the area, stop by Mariners' Church--it is definitely worth a visit. Anglicans will be pleased to note that it is an oasis of '28 BCP sanity. Why did the Fitzgerald sink? We'll likely never know in this vale of tears, especially since the Jacques Cousteau dive of the wreck didn't provide any new evidence. The two most likely theories are (1) a loose hatch cover or covers (there is documentation of the ship having this problem), which allowed water into the cargo hold, slowly and almost imperceptibly robbing the ship of bouyancy, and (2) the ship getting lost in the weather and straying over some dangerous nearby shoals. Frederick Stonehouse's indispensible book on the subject leans toward Theory #1 (at least in my printing). 23Some went down to the sea in ships, doing business on the great waters; 24they saw the deeds of the LORD, his wondrous works in the deep. 25For he commanded and raised the stormy wind, which lifted up the waves of the sea. 26They mounted up to heaven; they went down to the depths; their courage melted away in their evil plight; 27they reeled and staggered like drunken men and were at their wits' end. 28Then they cried to the LORD in their trouble, and he delivered them from their distress. 29He made the storm be still, and the waves of the sea were hushed. 30Then they were glad that the waters were quiet, and he brought them to their desired haven. 31Let them thank the LORD for his steadfast love, for his wondrous works to the children of men! Most, but tragically not all. Take a moment to remember the crew and families of the Fitzgerald, and all who go down to the sea in ships this day. The power's back on and the Prices are home again. Fair warning, though: if I post something like "My God, it's full of stars!" 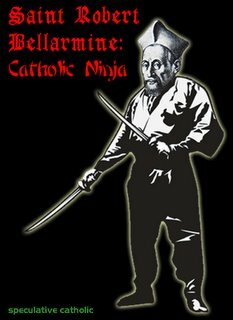 or "Of all the saints of the Catholic Reformation, St. Robert Bellarmine has struck me as the one who is most like a ninja," I have probably just learned at great and painful cost that some of the food in the freezer should have been thrown out. Let's see: No blinding flash of pain and the internal combustion engine still worked. That meant the latest power outage in The Price Neighborhood (a/k/a The Place Where Nobody DTE Energy Has To Worry About Enraging Lives) wasn't The Change. That, and the hot water heater and phones still work (SBC put up a generator on the line to keep the latter working). That's the inventory of good news. No electricity since 6:00pm Sunday, and no guarantee of when it will be fixed. That means no lights and no heat. Yes, Heather has an arsenal of candles that would put a Latino Saint's shrine to shame, but there's only so much patchouli vapor a human being can inhale without being overpowered by the urge to vote for Dennis Kucinich. Even--especially--when the only thing on the ballot is a millage proposal, as it is in our case today. We moved into a hotel yesterday before sundown. As in: crammed into 350 square feet with a now-walking infant, a giddy toddler and a slightly whiny pre-schooler. Yep, a little slice of pickled souse loaf. We have no idea when we'll be back. Someone stole our cable Tuesday. As in cable TV. Right in broad daylight. No, seriously: thieves cut about forty feet of our cable feed from the side of our house. He/she/them had a courteous streak, though--they made clean cuts, tucked the cut ends in and even caulked the hole where the cable fed into our house with some kind of silicon gel (helping us with the heating bill, I guess). The cable repairman said he'd never seen anything like it. That made three of us. My guess is that someone is enjoying free Comcast off a neighbor's feed tonight. The most remarkable piece of head-patting condescension you will see this year. From our friends at the Reporter, natch. Which, after one of its periodic hiccups of moral sanity, returns to being the cavalcade of frivolity we all know and love. Watch as a truth-as-Rorschach-Test advocate tut-tuts at a woman who bears all the marks of sainthood. I struggled to contain my anger. And I succeeded because this was Abena, a very simple woman, not a bishop, the pope or a Vatican spokesperson, all of whom, I think, should have a broader view of church history and the place of culture in determining our ever-evolving, collective understanding of God. How very white man's burden-ish of her to "contain her anger" toward such an obvious simpleton. "Ever-evolving collective understanding of God." OK. Whatever else it means, it's pretty obvious the "collective understanding" necessarily excludes the experience of the "very simple." But I have this strange feeling that it is very favorable to the enlightened world view of upper middle class leftish Minnesotans. She laughed readily, “Of course, we all should. But what is more important is that women learn the beauty of raising children. My blood nearly boiled at the sexist content of this assertion and her archaic proof of God’s mercy. prig, n. a person who obeys the rules of correct behaviour and considers himself or herself to be morally better than other people; see also National Catholic Reporter, Essayists for. The delight in the impending birth of a child and its ascription to God is an archaic sexism that makes her blood boil? [Cue Don King voice]: "Only in the Reporter!" Yet, I forgave her immediately because I recognized that she is a product of her culture. Remember, children, that one should never fail to forgive ignorant foreigners for their culturally-driven foibles. Only recently from Cameroon, she was jailed there for her faith. Shackled, she was beaten on the soles of her feet. Now, walking is difficult. Wearing shoes is still painful. This is the story Ms. Helminski should have written--a remarkable drama about a living saint facing deportation (unjustly so? Why can't she tell us?) and death with the true spirit of Christ. Instead, she wastes the better part of 901 words talking about what a theological rube her courageous friend is. To paraphrase Mark Shea: "Fixating on women's ordination makes you stupid." Proof? Try this, which shows the good--no, make that heroic-- work Ms. Helminski has done by adopting two Chinese children and assisting children inside China who have been orphaned by AIDS, and her 100% condescension-free essay on what motivated her to do so. Too bad that woman doesn't appear in this little bleat. I respect her a great deal. Yeah. Can't you just feel the respect, wafting up from the page. I admire the depth of her faith. Which is why she described it as being very simple, archaic, unevolved, sexist and conditioned by Abena's impliedly-backward culture. I am also aware that there is just so far the edge of her theological understanding will stretch and it is way back there on the opposite side of the church from where I stand. Sorry about that--my jaw hit the keyboard, my tongue lolled out and I got an electric shock from the keyboard. Watching a complete disconnect from reality does that to me, sometimes. we gently volleyed questions back and forth. Although she did laugh a few times, I detected no malice or disrespect. It was my questions themselves, questions she had never considered, that she found amusing. Unlike others with whom I have entered into such discussions, she was not intent upon recreating my soul in her image. Nor was I intent upon asserting my view to the exclusion of hers. That sounds wise--no headway possible at all on this one. I felt profoundly blessed as Abena pointed to the truth in her own experience without condemning the truth in mine. If the Holy Spirit truly guides the church, it is our responsibility to stand at the point God has placed us within the church and proclaim from the honest depths of our souls, “This is how I see God!” and respect each vision as equally valid. If the whole church entered into such respect-filled dialogue, surely the Kingdom of God would be manifest upon the earth. If this is "respect-filled dialogue," then I'm begining to understand why the Common Ground Initiative quickly became a progressive monologue. First, there's no talking with people who regard you as exhibits in an unusually freakish petting zoo. Ms. Helminski's exercise in theological condescension applies equally to American Catholics opposed to her views. Without that whole risk of impending martyrdom, to be sure, but just think how much "respect" she has for those who aren't facing death? Second, the "each vision as equally valid" shtick has been tried. It's called the Episcopal Church, USA. And the progressives are chasing opposing "visions" out with pitchforks and torches. More to the point, it's wrong. There's no "equal validity" between diametrically opposing views. Someone is wrong and will come out on the losing end, eventually. Even Ms. Helminski believes that. With all her heart. Her last-minute assertion that Abena's view is "equally valid" is grimly humorous, following as it does a litany that began with describing that view as "very simple" and ended with a claim that it was based in cultural inferiority. Peg is right and Abena is wrong, and that's clear from the outset. Intra-church dialogue is a non-starter. Pleasantries can be exchanged, to be sure. But when you go in acting like an anthropologist among the primitives, it's going to end with your "subjects" making for the exits sooner or later. If you have nothing to say, don't say it. I think that's a Yogi Berra-ism. Even if not, it's good advice.